Happy Monday dear friends! 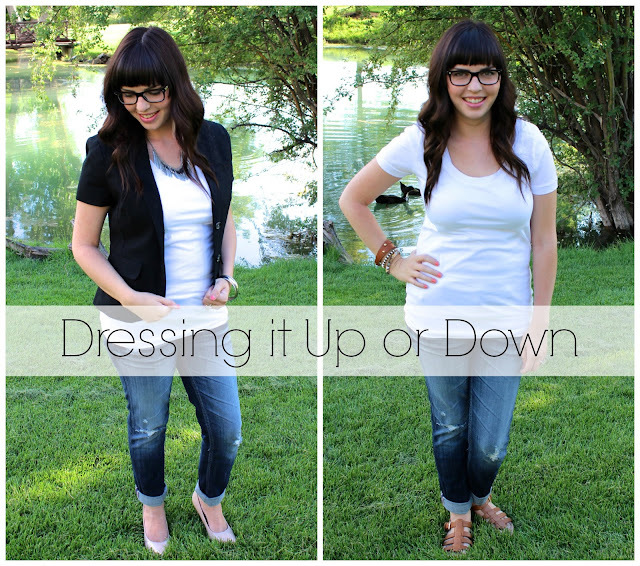 Today I want to show you an easy way to transition an outfit. As a mom I often find myself opting for the simple, no-fuss option for getting dressed when I'm chasing my little guy around during the day. Then, sometimes I have to completely change my outfit if I want to do date night with the hubby or something of the likes which is a PAIN. I've found it's so much easier to just change up a few accessories to go from simple, casual, and dressed down, to more accessorized and dressed up! 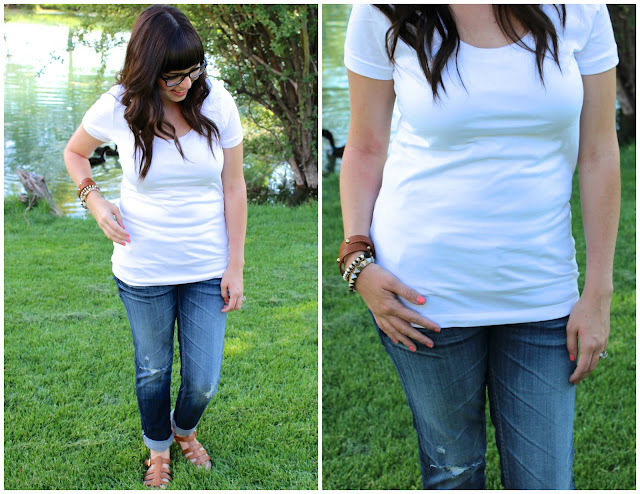 For the more casual look I just added a few fun bracelets and wore some summer-y sandals! Super easy, just how I like it. Also, do you love my new glasses? I usually wear contacts but I like to have glasses as a backup, and to wear when I want to change up the look a little. I just got these a few weeks ago because my other ones were gettin' pretty old. I love them! I'm sure you'll see more of them in future posts. Aaaaand, here's how I did dressing up (which you've seen already if you read my guest post on Jessica Jean's blog)! For the dressed up look I just added a short sleeved blazer and a necklace, swapped out the the bracelets, and wore heels instead of sandals! 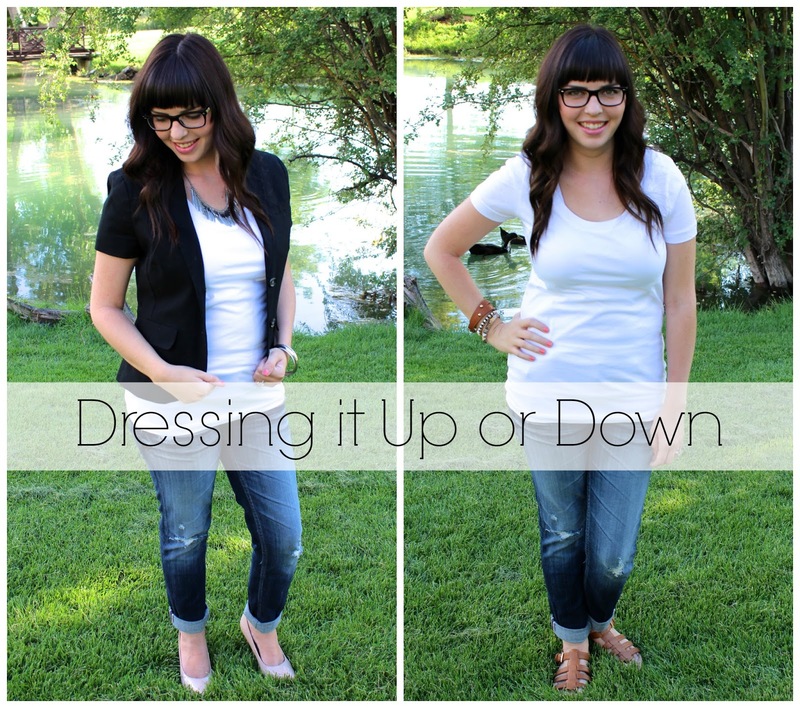 Now I'm curious, how do you transition your casual outfits to be more dressy? Also, it's time to announce the winner of the Urban Outfitters giveaway! Yeah Stacy! Congrats! Contact me within the next 48 hours to claim your prize. Thank you all for entering and I will keep you updated about the next giveaway! GREAT necklace and I have glasses envy. Thank you! I seriously love these glasses... so glad I needed a new pair and found these babies! oooh I saw that necklace the other weekend at H&M and I almost picked it up, but then decided against it (I have way too many necklaces). Now I wish I had bought it anyways! haha. That happens to me all the time! I almost passed up on this necklace too and I'm so glad I didn't! I have a hard time not wearing it with every single outfit! Ahh, such a fabulous compliment! Thank you! Sometimes it can be hard to have good grammar when I'm blogging because I'm writing the way that I would talk, but I definitely try to make it readable. It's a pet peeve when someone writes and their grammar is so bad you can't really understand what they're saying! You pretty much have my dream hair. Seriously love. Thanks so much for stopping by my blog; it's so nice to meet you! Thank you! I change my hair so much because I'm never totally satisfied with it... but this time I think I've found a hairstyle that I'll stick with for a while. Your necklace is perfect! I love both looks. White shirts are so versatile!! I love your necklace!! It's so pretty! I think it's so fun finding other LDS bloggers too! THanks for following and I'm excited to follow along with you too! Your haircut is adorable. Cute necklace. I love simple outfits with great accessories. Thanks for linking up! I like the dressed up version!... and I am jealous of your bangs. :) Stopping by from the trend spin link up! Nothing beats a perfect fitting tee!